Located in the headwaters of Avoca River, below the junction of Hanging Valley Creek. It has six (6) bunks, and a wood stove. This hut is owned by Canterbury University Tramping Club. Warning: Casey Hut in the Poulter Valley has burnt down! 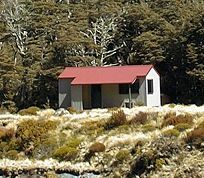 Next available hut in the valley is the Trust-Poulter Hut about 5km upstream of the Casey Hut site; it only has 6 bunks! Carry a tent otherwise. A report by DOC recommends not replacing the 48 year old Casey Hut that burnt down in the Poulter catchment late last year. The Federated Mountain Clubs (FMC) and others are not comfortable with this decision and is seeking public feedback from club members and other Park users. Visit goo.gl/forms/R8u2HPu2CG to make your opinion known! The new 20 bunk hut was completed in late 2007. It is located about 1km upstream of the old hut site in beech forest (200m above the junction of Discovery Stream) about 4 hours walk up the Hawdon River from Hawdon Shelter. Good camping spots exist in this area. Is for emergency use only. It has NO BUNKS or WATER. It is in a avalanche zone (in winter).